There is a secret that most Midwesterners would like to keep that way--a state park that rivals many of the over crowded national parks for natural beauty, history, and family fun. Where, you might ask? In the southern Black Hills of South Dakota. There is a secret that most Midwesterners would like to keep that way–a state park that rivals many of the over crowded national parks for natural beauty, history, and family fun. Where, you might ask? In the southern Black Hills of South Dakota. Custer State Park was established as a game preserve in 1913 and encompasses 71,000 acres of some of the most stunning scenery in the Black Hills including 7,242 foot Harney Peak, the highest mountain east of the Rockies. There are lakes and streams for fishing and swimming, more trails then you could cover in months, and spectacular wildlife viewing-including a herd of 1500 wild buffalo. 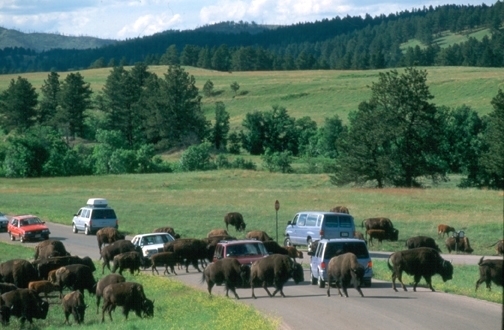 1.7 million visitors come to Custer State Park every year but it never feels crowded. In fact if a person was so inclined they could spend the day hiking in the park and never see another human being. That’s one of the many things that make Custer State Park so special. Start your day at Custer State Park nice and early when the wild life is still out and about and not hiding in the trees to avoid the heat of the day. Pay your park entrance fee of $5 per person and be sure and ask the attendant where the buffalo are. No kidding, they can tell you exactly where they were last seen and they keep the information up to date. With park map in hand, drive to the Wildlife Loop that covers 18 miles of pine forest and prairie. Drive slowly and you will probably see pronghorn sheep, mountain goats, elk, very friendly burros that will eat anything you give them, more prairie dogs then you can count, and the ever popular buffalo. 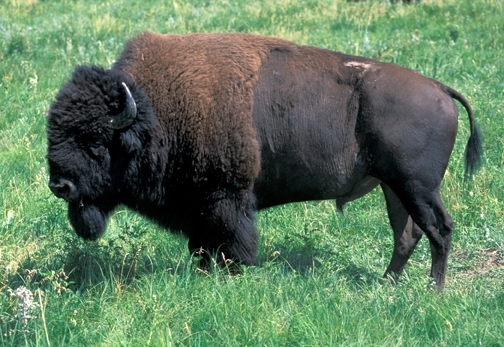 When you find the buffalo don’t forget they are wild, very fast, and, if they have calves, very protective. But you will probably be intimidated enough when a bull the size of an SUV crosses the road in front of you. Take lots of photos because it is an awe inspiring sight and certainly not one you see everywhere. When you exit the Wildlife Loop you will be in the vicinity of the State Game Lodge, which has been called the Summer Whitehouse because of presidential visits. Built in 1920 it is a rambling mix of elegant and the outdoors so make sure you take time to look around a bit and enjoy the history displayed on the walls. Stop in the restaurant, sit on the deck if the weather is right, and enjoy a brunch of Buffalo Benedict, made with buffalo salami, fresh trout, or just go for it and have the breakfast buffet which includes a wide variety of fresh fruit. After breakfast how about a little hike to stretch your legs? Custer State Park abounds in great hiking trails and one is close by, across the street at the Grace Coolidge Campground. The trail is flat, goes three miles one way, and follows Grace Coolidge Creek to Center Lake. You’ll cross the creek a few times so watch out for that sparkle in the stream bed as this was the very area that George Armstrong Custer and his expedition found gold in the Black Hills. And, if it’s spring or early summer, the wild flowers will be on display in incredibly vivid colors. Hop back in the car and head down Highway16A for a little history at the home of Charles Badger Clark, the first poet laureate of South Dakota. He built this rustic cabin, known as Badger Hole, in the 1930’s and it is now open to visitors. Take a walk on the Badger Clark Historic Trail and read his poetry at different stops amidst the cool air beneath the tall pine trees. Cut south on Highway 87 and stop in at Blue Bell Lodge, and get ready to ride. The stables at Blue Bell Lodge offer one hour trail rides for under $30 per person. The rides take you through some of the prettiest parts of Custer State Park and no experience is necessary as the horses and the cowboys know what they are doing. There is a casual dining restaurant at Blue Bell Lodge so stop in for a burger, a glass of wine, or an ice cream sundae after your ride. Back to the car and head up 87 and prepare for one of the best scenic drives in America-the Needles Highway. The road is part of the Peter Norbeck Scenic Highway, designed in the ‘30’s by Senator Norbeck himself. The highway is 14 miles and takes a couple hours to really enjoy. You’ll encounter hairpin curves, pigtail bridges, one way tunnels, views of granite pinnacles and spires surrounded by green valleys and pine forest that will amaze and mystify. You will want to stop at several of the pull offs for pictures and keep your eyes peeled for more mountain goats hanging miraculously off the sides of cliffs. One day gives you only a small taste of Custer State Park so consider getting a room at one of the three lodges, or booking a campsite or cabin. Each lodge has a restaurant and there are other activities available like jeep rides, and chuckwagon cookouts. The park also has great swim beaches on three lakes and boat rentals if you want to paddle around. If you do stay for a night, buy tickets to the Black Hills Playhouse, also in the park. The playhouse is a professional theater company that presents plays and musicals through out the summer. The performers and crew audition or apply to work there and live on site. Come for a day or stay for a week, Custer State Park has plenty to do. People in South Dakota and the surrounding Midwest know a good thing; you may as well enjoy it too.